Nick worked as a technician for two years before he decided to become a certified clinician. He is currently finishing his Masters of Prosthetics and Orthotics degree from Northwestern University in Chicago. He has able to join AALOS on January of 2019 while he finishes his last semester online in preparation to start his residency in April. 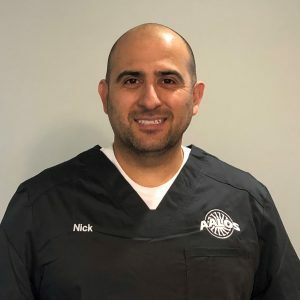 Nick is passionate about providing the best patient care possible and is eager to start forming lasting relationships with patients as he begins having a more active role in patient care. Him and his wife are new to the area and are looking forward to discovering all that Alabama has to offer.